This is Part II of Frank’s report on his recent trip to Sicily. Read Part I here. Tucked away off a roundabout outside Ispica, Riofavara is a relative newcomer even though its vineyards are almost a hundred years old. It wasn’t until 1994 that Massimo Padova and his sister Marianta began the process of redirecting their forty or so acres throughout the Val do Noto to winemaking. The past two decades have produced admirable results. We arrived at their cantina as a busload of American wine professionals finished up their tour and tasting, fortuitous in that we received Massimo’s uninterrupted hospitality. This is a limited production winery, a mere 6000 cases a year dedicated to native grapes that make wine indicative of its place of origin, the first to produce Nero d’Avola with indigenous yeasts. As evidence of their commitment to sound agricultural practices, Riofavara opted to go beyond the usual standards for organic winemaking by meeting the stricter qualifications of ASCA (Agricultural Services Certified Organic) to attain certification. As he pours it is obvious he is not a salesman, even though the wines can be purchased on site. Massimo will talk about them, but not push them or make observations as we sniff and sip. He is genuinely interested in our comments about what we are experiencing. As he puts it, “My job is done when the cork is put in the bottle, after that…” followed by a shrug. He admits that the business end pays the bills, but it is not what he is comfortable with, nor what drives him. The accolades and awards his wine receives is validation that Riofavara is on the path he chose. The wines are excellent and, like those of Francesca Curto, make a statement for the ability of the Eloro DOC to provide the natural material for Nero d’Avola worthy of recognition. The Spaccaforno 2011 (the ancient name of Ispica) has that faint oceany scent that has me wondering if this is common for this region. That’s followed by intense and fruity aromas of cherry and red plums. It is lively in the mouth, the fruit flavors pop with the help of acidity spiked with minerals and an ongoing freshness that picks up a spicy, rustic edge. This is a wine whose elements are in sync, a harmonious introduction to unfiltered Nero d’Avola made with minimal intervention. Named in honor of Massimo’s grandfather, Sciave 2010 is richer and has a finer texture, a wine from older vines that undergoes longer and more involved aging. The nose gives off waves of anise, red berries and Mediterranean herbs. It takes a while to discover its secondary sensations, but when they arrive it’s as if feral fruit has been naturally tamed by a seamless texture and the firmness and structure of unobtrusive tannins. Like the Spaccaforno, the whole has integrated so that the sum surpasses the parts. This is some serious Nero. A couple of weeks later, at a dinner with wine savvy friends, one made the comment that it was as if he was tasting Nero for the first time. The revelation of the day is the Notissimo Moscato di Noto 2013, of which only 300 cases are made – the reason two bottles flew home in my luggage. It causes a head tilting, eye-rolling Andrew Zimmern reaction. This is unadorned, clean and refreshing Moscato, unlike the thicker Sicilian dessert wines from Lipari and Pantelleria. In some years, 10% of the grapes will be sun dried in boxes – about as old school as it gets. Scents of citrus, oranges, fresh stone fruit drift from the glass. It is sweetly mouth filling without being dense. The juicy acidity is mildly spicy and keeps it lively through a warm, lingering finish. Both Riofavara Nero d’Avola bottles are available in PA: Spaccaforno 2010 for $16.99 (#43301); Sciave 2010 for $27.99 (#43300). To say that Corrado Gurrieri devotes his life to maintaining a connection to land that has been in his family for over 200 years is an understatement. He is foremost a farmer, but one who has undertaken projects whose importance transcends the boundaries of his vineyards. He was responsible for helping develop and codify the specifications for the Eloro DOC; he teams with universities and laboratories to promote agricultural research and, through his vineyards, to monitor the needs of the land; as a teacher, he hosts students at the winery in order to share ideas and methods. That Corrado speaks no English was not a problem since it is his wife, Valeria, with whom I’ve arranged our visit. We first met at a dinner in Philadelphia in the spring of 2013. Valeria readily admits that coming from Palermo, “I was a city girl, I knew nothing of this type of life or how a farm worked.” She has adapted well, which became evident as she guided us around Casa di Natale, the winery named for Corrado’s grandfather. It occupies the crest known as Buonivini (good wines), the most prominent hillside between Ispica and the sea, bequeathed to Corrado in 1990. Valeria walks us through the original palmento, and we step back into the early 20th century. Stone cubicles once used in the winemaking process contain religious and agricultural artifacts – a portable altar and candlestick holder for the visiting priest; straw covered demijohns; a peasant’s table and chair- each display reminiscent of a schoolchild’s diorama. She informs us that the daily ration for a worker was “…a half loaf of bread, a slice of cheese, a half- liter of wine, and one sardine,” and that pregnant workers would toil almost to the moment of delivery. She adds that Corrado’s grandparents were well known for caring and providing more for their workers’ welfare than was common. Strolling among vines whose work is done for this harvest, Valeria points out dry vegetation between every other row and explains that Corrado has invented a device that flattens rather than cuts the growth. 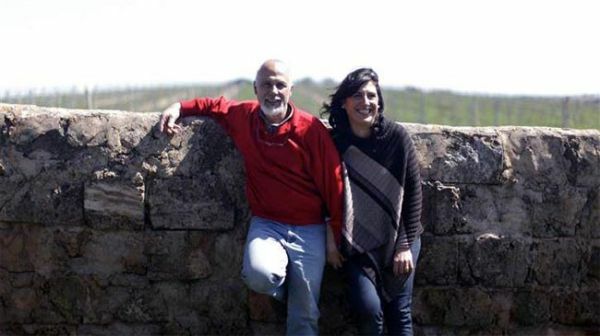 He is, she says with obvious pride, “…always looking to do more, to help the land, to understand the land.” Some would describe it as a passion, but it is more like a calling that has been answered by making wine that respects the natural order, resulting in La Favola earning organic certification. Over the course of three hours we will be treated to hospitality that makes us feel more like old friends than visitors. Sitting under a canopy of century old trees on stumps surrounding a rough- hewn table, the three of us while away an early afternoon chatting about a variety of subjects and family matters that have nothing to do with wine. Valeria coats slices of bread with the farm’s olive oil as a prelude to a tasting that will soon be moved indoors by a light shower. We start with the Sicilia Bianco IGT 2013, a 70/30 Catarratto-Grillo blend that is refreshing, very much a crisp coastal white wine with scents of land and sea, local herbs and flowers and the citrus found in many Sicilian whites. It is savory, with lively acidity that never wavers, a perfect match for any number of seafood preparations. We move on to La Favola Eloro DOC, their basic Nero d’Avola. The nose is clean and ripe with something spicy I can’t quite define. A rounded mouth and smooth tannins provide a platform for dark berries and fennel. Full of flavor, this is pleasant and easygoing, and has the acidity to complement a variety of dishes. Next, La Favolosa, also a Nero, more refined and aromatically complex with berries and the cocoa-like essence of carobs. Fuller bodied and just a bit more tannic, it has the same berry-fennel profile and stays focused from start to finish. Next Valeria pours Syna, a 65/35 mix of Nero and Syrah with aromas that appear to be common for this terroir – spices, herbs, flowers – but no hint of the salinity or ocean water I noticed on the Curto and Riofavara wines. It is full bodied and fills the mouth, the Syrah adding some depth and weight. Again, a wine which could be paired with a range of food from grilled fish to pasta with a meat based ragu. Corrado drives up as we are preparing to leave. He proposes a toast with his Refosa Moscato di Noto 2012. The texture is midway between those of Curto and Riofavara. Aromas come in waves of peach, apricot, and fresh figs wrapped in a blanket of honey, all of that segueing to the palate along with a touch of roasted nuts. The aftertaste is spectacular. Corrado regards this hillside as his and Valeria’s own slice of heaven, and once said that the goal was not to make the best wine in the world, but to make the best wine he could in their little corner of it. There is no better way to describe what they do. Several of Tenuta La Favola’s wines are available via SLO in Pennsylvania. Stay tuned for a final installment, where Frank recaps some Sicilian wines he’s tried since his return to the states.